What’s On Tap This Summer? Cooling off with a frosty, light beer is a great way to unwind at the end of a sweltering summer day. This popular golden beer is an American wheat ale that’s crispy and tangy with a hint of citrus and pepper. It contains lemon peel and Grains of Paradise. At 166 calories per serving, it’s a great light choice. This is a hand-crafted beer from Riverhorse Brewing Co. in Ewing, NJ. It’s a light and refreshing American Blonde Ale. Technically, this isn’t a beer; it’s a mead, which is an alcoholic beverage created by fermenting honey with water, as well as fruits, spices, grains or hops. (The hops act as a preservative and give the drink a bitter, beer-like flavor.) A mead can be dry, semi-sweet or sweet. This whimsical variety is a lightly carbonated honey wine with tea and lemon juice. Although this isn’t a summertime beer, we enjoy this variety during the warmer weather. 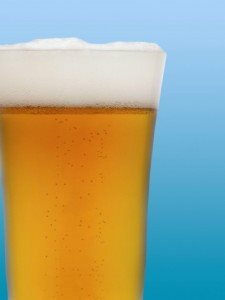 A session beer is one that contains no more than 5 percent alcohol by volume. The beauty of it? You can drink multiple beers without actually getting drunk. This is a farmhouse ale that was traditionally brewed in the winter and was meant to be consumed during the summer. There’s been a revival in this beer style over the past few years. It tends to be fruity with mild to moderate tartness, and there are spicy notes with medium bitterness. This style tends to be semi-dry with only a hint of sweetness. First brewed in Koln, Germany, this beer is now created in America. It’s pale and dry with a light to medium body, and it’s only slightly bitter.